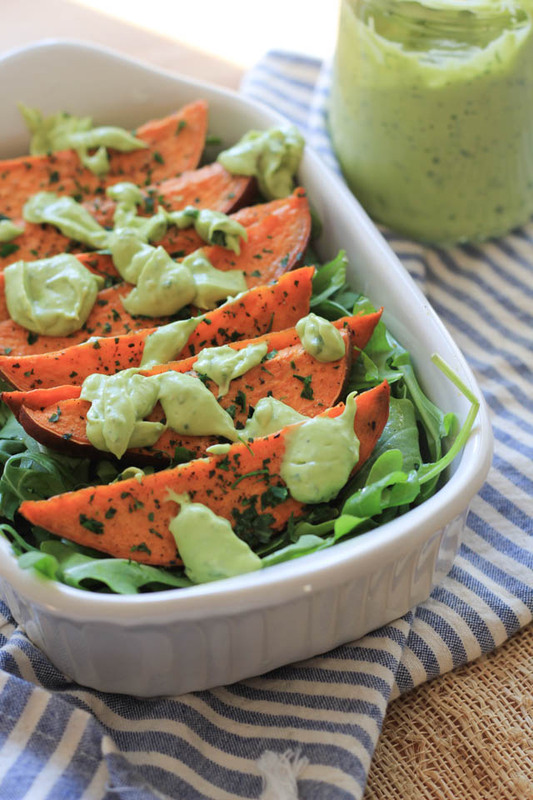 I’m loving all over this dressing slash dip recipe. I am a big fan, and I could dollop it over everything! I tested the recipe a few different ways with burrito bowls, rice bowls, and roasted vegetables like sweetpotatoes, it worked on all of it! I made a rice bowl with brown rice, black beans, sliced sweet peppers, green salsa, arugula, and a huge dollop of this which honestly made the entire bowl the best rice bowl I’ve ever made. 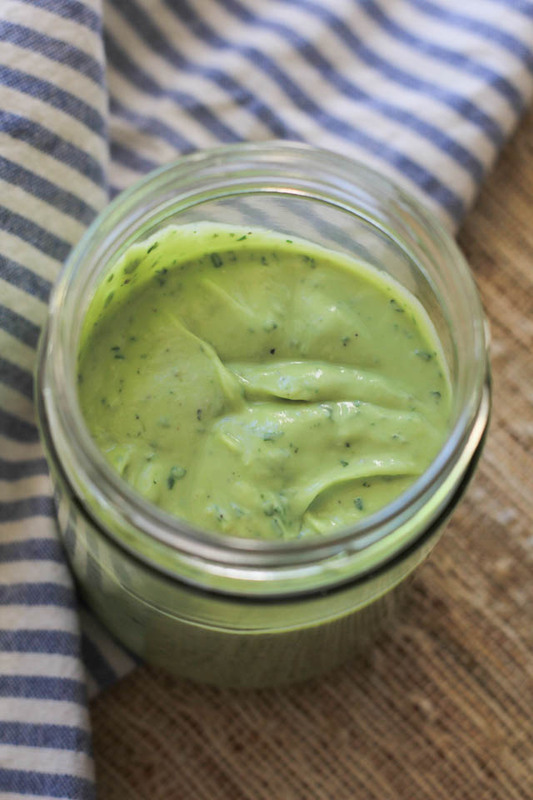 Place avocado, yogurt, cilantro, garlic, lime, salt, and pepper in a blender or food processor. Blend on high until smooth for 1-2 minutes. Pour in a jar fitted with lid, or Tupperware with lid. Use immediately or store in fridge for up to 3 days. Use the dressing on all sorts of great dishes like salads, burritos, rice bowls, as a dip for other vegetables. The possibilities are endless! I cut a sweetpotato, roasted it with 1 tablespoon olive oil, sprinkled with salt and pepper at 400 degrees for about 15 minutes. Serve that over a bed of greens, sprinkled with Gourmet Garden lightly dried cilantro for freshness, and dollops of the Creamy Avocado Cilantro Dressing. Enjoy! I want this dressing over EVERYTHING! I’m a HUGE GG fan and buy their herbs all the time. This looks so good! Is it bad that I want to just eat this with a spoon? It looks SO fantastic! LOL!!!! Such a good thing! This could be good with so many things but for me a dollop on a breakfast burrito is calling my name!! That’s so great that you mom is going to visit her sister! Hope she has a great trip and hope your wall painting went well. 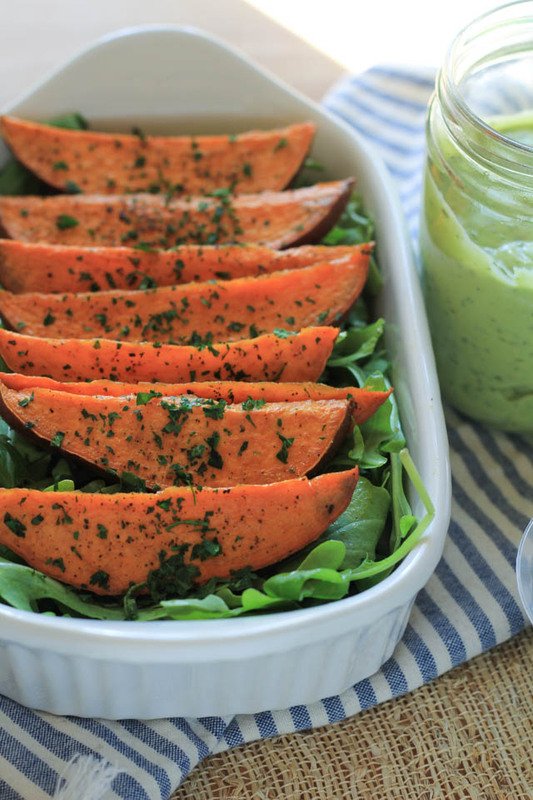 You know I love everything with avocado so this IS the recipe for me! Awe, thank you so much! She got there today safe and sound :)!! This sounds wonderful – the color and consistency! This reminds me of a sauce that’s served at El Pollo Loco (chicken restaurant in California) that is to die for! LOVE avocados any which way! I know exactly what you’re talking about! I used to live in Ca! Yum! I love anything with avocado. Wow! Fabiola I am so excited for your mom to get to be in Mexico and visit her sister! I can not imagine going years without seeing my sister. I painted a red wall blue/grey. It was so refreshing. And this recipe! I have everything in my kitchen and I was planning to make enchiladas with some leftover sweet potatoes – this will be the perfect addition!! Sounds and looks good. My wife want non-dairy, any sub for the Greek Yogurt? Hi Graham! Hmmmm, let me see… I would add another avocado instead of yogurt. Same consistency, and you can get the tang form the lime juice anyhow. If I think of another sub, I’ll let you know. I hope you and your wife are well!